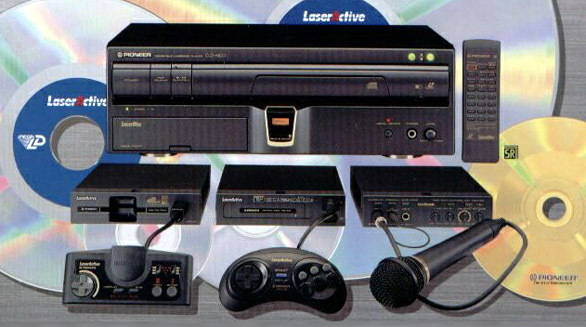 The LaserActive was an incredibly expensive console which, while being a great modern-day collectible, was late to the party when released in 1993 by Pioneer. 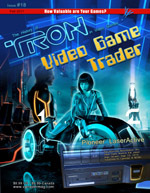 It was a laserdisc-based gaming platform that had the ability to overlay 16-bit graphics over high-quality video just as the laserdisc format was breathing its last gasp. Pioneer's sole videogame console entry is perhaps the only true convergence of multiple forms of media in gaming history. While the Philips CD-i and Trip Hawkin's 3DO tried to offer a true “multimedia” machine, only the LaserActive actually allowed multiple formats to operate on its hardware.. even if it did so in a very bungling manner…. It could also mow your lawn, wash windows and shovel snow. NOT REALLY. But it did offer 3-D Goggles that were compatible with five different titles. Interestingly, the goggles could also be used with the Sega Master System. Of course, one could purchase SMS goggles at a much lower price…. The LaserActive was priced at a cool Grand. To “fully expand” the unit so that it could play all the available formats, an additional investment of 3K would be required. Without any modification, the LaserActive could play only six titles. Additional control modules, referred to as “PACS”, would slide into the LaserActive front docking bay allowing more compatibility and capabilities. One PAC allowed domestic Sega products, such as Sega Genesis cartridges and Sega CD formats, to operate on the LaserActive. Sega's Japanese software, such as the MegaDrive or Mega-CD formats, were region-locked and required a separate Sega PAC. Approximately twenty LD-rom game titles were released which required the Sega PAC. NEC also allowed support for its products to be played on the LaserActive. Both their HuCard games and multiple cd-rom software formats could be played. The PAC allowed TurboGrafx-16, PC Engine, CD- ROM 2 and Super CD titles to be enjoyed on the LaserActive. Similar to the Sega PAC, the games were all region-locked to their prospective territories, so two NEC PACS would be required to play both domestic and Japanese game titles. Only nine LD-rom 2 titles were released for the NEC PAC. Why a consumer would pay for the Sega PAC module when they could buy an actual Sega Genesis with a Sega-CD unit for less than half the six-hundred dollar price is still a real mystery. The Turbografx-16 equipment, which at the time was being liquidated, was selling for even less! If you wanted to sing Karaoke with your LaserActive, then be prepared to empty a second bank account of another three-hundred and fifty dollars. Otherwise, do yourself and everyone else a favor, and just sing in the privacy of your own shower! It did come packaged with a microphone and was compatible with around two-hundred karaoke titles. If you wanted to stretch your vocal chords in both English and Japanese, you would need to purchase individual PACS for each geographic region, doubling the expense. The LaserActive could also be controlled by a personal computer. The Computer Interface PAC allowed a 33-button remote to connect to a computer via its serial port. Using the enclosed LaserActive Program Editor, a user could bypass the regular 24-button remote that was packaged with the LaserActive unit and progress through a series of complicated steps to further dilute the operation of the equipment, if he so desired. Once you had all the hardware, all you had to do was take out a loan and then, for only $250 each, you could purchase a laserdisc game to play. Even SNK's hefty Neo-Geo home console looked like a bargain in comparison to Pioneer's venture. If all these items seem expensive to you, remember that these prices are almost two decades old and do not take into account inflation since the early eighties. In essence, it was even more expensive than it sounds! The price was not the only factor that made the Pioneer LaserActive a beast! Unlike most gaming systems that are molded plastic, the LaserActive is manufactured of sturdy steel. Weighing in at 25 pounds and measuring 6 inches in height by 17 inches in width by 15 inches depth, it is rumored to have dingo-like qualities and eat three-year old human children! While the system was released by Pioneer, it was not very pioneering. Many believe the LaserActive to be the only laserdisc home gaming console. That is, in fact, a fallacy. In 1985, Rick Dyer, of Dragon's Lair fame, released the Halcyon through his company, RDI Video Systems. The Halcyon had only two games released for the console when RDI went bankrupt. So, even the dismal showing of the LaserActive outperformed the Halcyon. Of course, the Halcyon could be voice-activated and control the lights in your house and that alone is so much cooler than anything the LaserActive could dream of accomplishing even eight years later…. Currently, despite its lackluster performance, the LaserActive remains very collectable and very expensive. Selling less than ten-thousand units while on the market for just over a year, the system still sells for close to its' original one-thousand dollar price tag and most games demand more than a hundred dollars a pop each. The Turbografx-16 PAC, the rarest of the LaserActive equipment, sells for more than the original six-hundred dollar price tag. In the end, Pioneer's laser disc system was, and still is, relegated to a rich kid's toy. If you're filthy rich, buy two!